Mid December through early January we were fortunate to stay near Hampton Court Palace. The size of this grandiose palace is impressive enough when viewed from the bridge over the Thames and as you can imagine it gets even better close up! Originally built by Cardinal Thomas Wolsey in 1514 he eventually gifted it to Henry VIII after he failed to secure an annulment for Henry and Katherine of Aragon's marriage. In spite of his generosity he fell out of favour with the king shortly thereafter and was charged with treason. Henry then set about to refurbish both the exterior and interior of the palace and make it his own. A stone wall surrounds the palace grounds (a total of 750 acres) and from the street entrance to the palace proper it is at least a third of a kilometre. During the Christmas holidays an outdoor ice rink drew a crowd and beneath the umbrellas seen at the far left was a restaurant to grab a meal, snack or beverage. ...and into an enclosed rectangular space or courtyard known as a quadrangle. Staff often greet visitors in period costume and during our visit it was the Elizabethan era. Adding to the atmosphere were these musicians playing the top ten hits of the day (circa 1558 - 1603). Entering the Great Hall (Britain's last and finest medieval banquet hall showcasing King Henry VIII's lavish tapestries) we were treated to a song and dance performance that featured a unicorn killed by a hunter but brought back to live by Queen Elizabeth I herself with just a royal wave. In this very same hall William Shakespeare's company - the 'King's Men' - performed for King James I at Christmas and New Years 1603-4. The royal bedrooms are lavish and meant to impress, although they were more for show and rarely used. This dining room, however, was used by King James I who unlike many royals preferred to eat alone or with a few close friends rather than be on display or seen in public with an entourage. The ceilings in the palace were painted with the intent to surpass those found at Versailles. This staircase is so massive it was impossible to capture all of its glory in a single photograph. The gardens are equally breathtaking - even in the dead of winter. Opposite to the palace and directly behind where I took this photo is a man made lake fit for a king or queen and yes, those are swans. On the side of the palace closest to the Thames are more formal gardens. 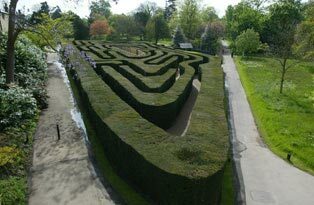 Hampton Court Palace is also home to the UK's oldest hedge maze planted in 1700. 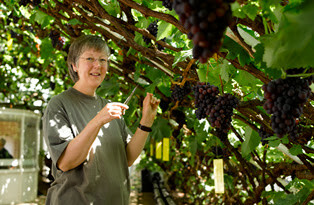 It also has the largest grape vine in the world (planted in 1769 and still producing grapes). Even the chimneys are works of art. We thoroughly enjoyed touring Hampton Court Palace and the surrounding area made possible by these adorable felines. Brother and sister, Opus and Lima, who were great company and very quickly stole our hearts. A special thank you to M&T for welcoming us into your home during the holiday season and giving us the opportunity to care for Opus and Lima. What a lovely way to end 2015 and usher in 2016. Speaking of, we'd like to wish everyone a happy, healthy 2016. Cheers!